The email campaign sharing option allows you to insert a hyperlinked player thumbnail in one-to-many email communications. The code is often added to an email template in your marketing automation platform or email distribution software. Link to a URL where you've embedded the player (a landing page on your website, for example). 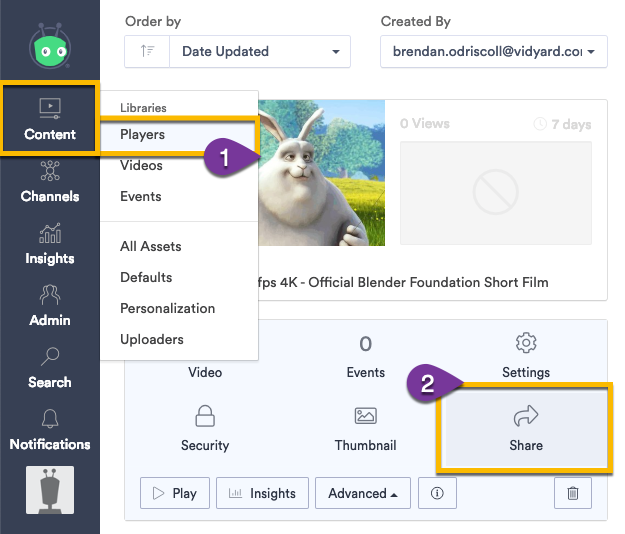 Select sharing page to link to a Vidyard-hosted page where the player is embedded (remember: sharing pages can be designed and styled to your brand). An email campaign is a massive opportunity to identity viewers and gain valuable insight into the effectiveness of your video messaging. Learn how to identify your viewers and capture the video view data in Vidyard.